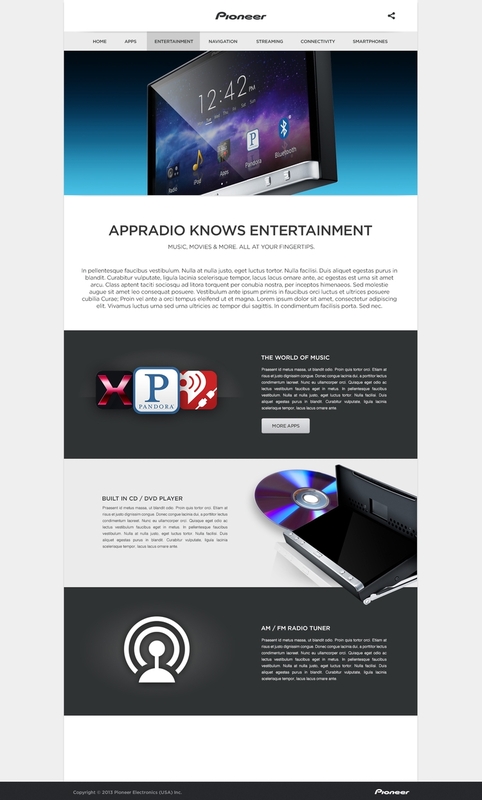 A launch campaign created to unveil the AppRadio 3 from Pioneer. AppRadio 3 is Pioneer's most forward thinking product yet. It bridges the gap between the smartphone and the car multimedia system. Never before has there been a product that allows for such safe and seamless use of your smartphone and car stereo system while on-the-go. In order to showcase the way the product works, consumers had to first be educated on what the product is. 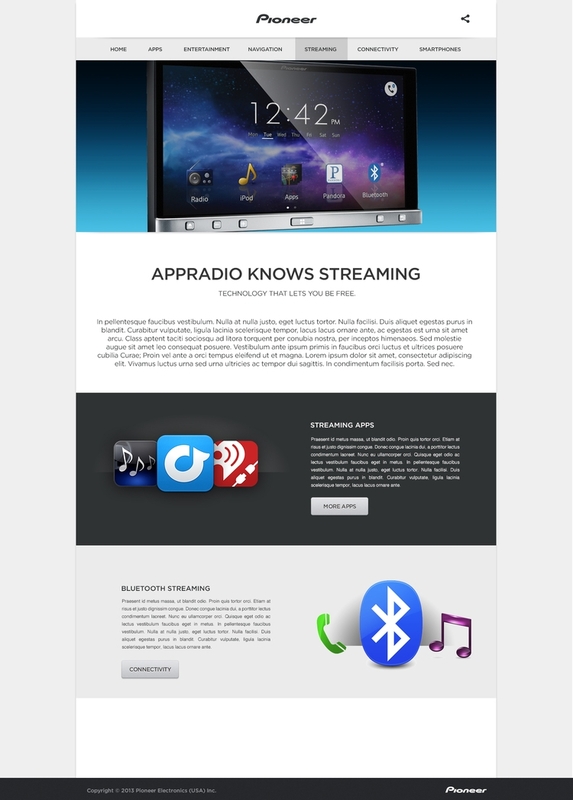 Previous attempts at promoting AppRadio 3 had focused solely on its touchscreen technology or the apps it could run. This worked to a degree, but the consumer had to have a fundamental understanding of the product in order for the messaging to be effective. As this was not always the case, the marketing sometimes missed the mark. These concepts also utterly overlooked the heart and soul of the product, which is that it brings the ease, simplicity and fun-to-use lifestyle that essentially comes standard with a smartphone into the car. The marketing had to convey all of this is an engaging way without losing sight of any of the key points. We started by setting up a shoot to capture all still photography and video production. We enlisted the help of our friend, photographer Michael Neveux and his studio to help with the image capture. We had the prototype product in hand and wanted to shoot it in the very simple jewelry-esque style that consumers have come to love for technology as well. Once the shoot was complete, the retouching began. This was an extremely extensive process; we prepped multiple angels and had to get multi-tiered approvals from Pioneer USA and Japan. With all the approvals inked, we could finally really kick off the creative. We wrote a video script that encompassed all the major selling points the AppRadio 3 offered and put it together using a combination of live action shots and animations that we had created and animated in-house. The end result is a video ad that showcases the beauty of the AppRadio 3 and its groundbreaking features while educating the consumers on the benefits of ownership. Simultaneously, we built a HTML5 site that showcased the features outlined in the video in a simple multi page layout. 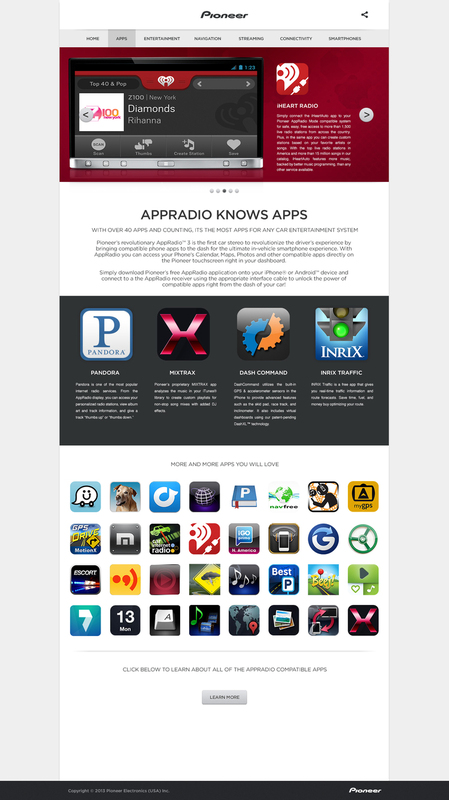 To create the most impact, we created large icons and graphics that promoted the apps available on the AppRadio platform. Much of the magic of the AppRadio line is in the Apps and we needed a place to highlight them and help our consumers learn. With dynamic pages and content, the site was launched with a countdown clock ticking down the moments until the big launch. With the press under a strict embargo until a 6am Eastern launch time, we we under pressure to synchronize each part of the campaign launch to correspond with the lifting of the embargo. Each piece of the campaign - ad campaign, video, and website - had to go up simultaneously. This launch was executed without a hitch and was a success. 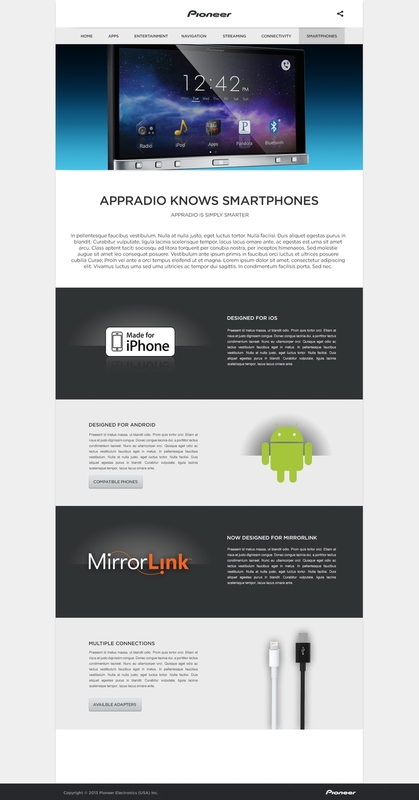 With substantial press coverage, all linked to our custom AppRadio site, and custom AppRadio giveaways going to key press and dealers, the AppRadio 3 launch was proof that with pre-planning, execution and our fantastic creative team, a strategic multi-tiered campaign can make a big splash. The ad campaign featured a simple straightforward message that featured the tagline "AppRadio Knows". 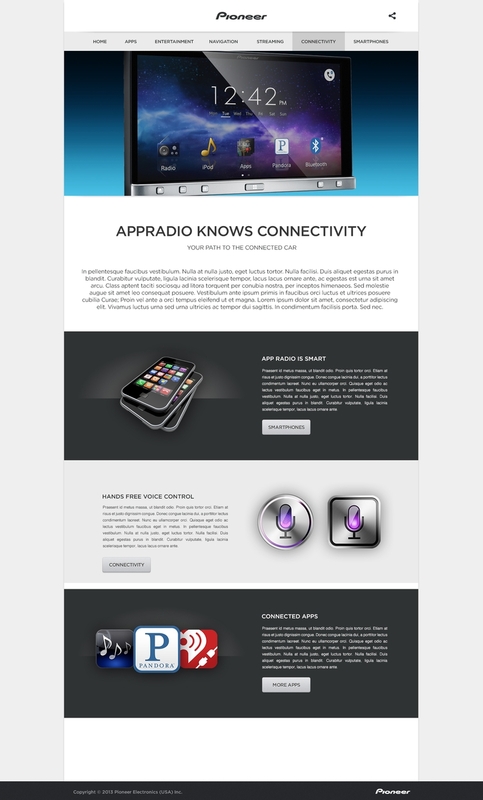 With this simple tagline, we conveyed that the AppRadio has vast resources that can be translated to your life. 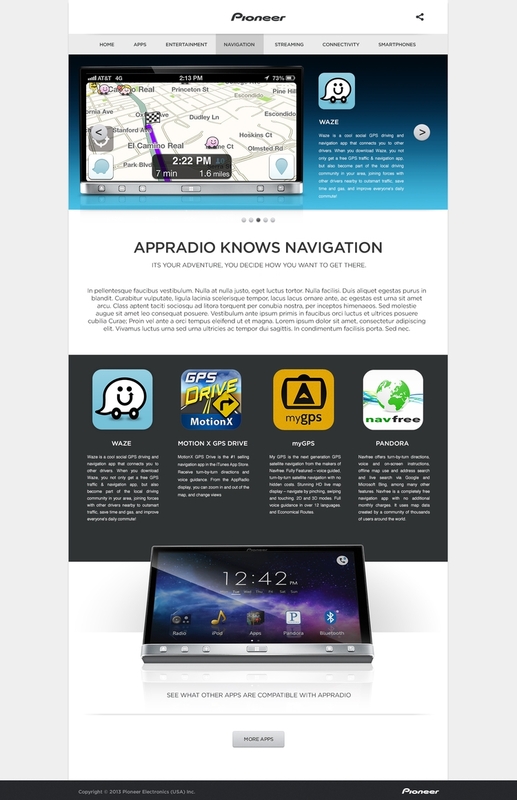 With enviable abilities and ease of use with Apps, Entertainment, Navigation, Streaming, Connectivity, Hands-Free, and Smartphones, the campaign showed that AppRadio knows YOU. Digital, print and environmental ads were created and timed to correspond with the overall launch.